Can a good diet make up for a bad gene? 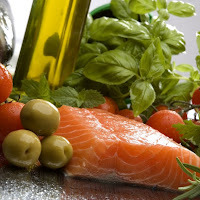 The Mediterranean Diet appears to do just that. Scientists studied the relationship between diet, genetics and stroke, which causes vascular dementia. Find out what they discovered. A gene variant strongly associated with development of type 2 diabetes appears to interact with a Mediterranean diet pattern to prevent stroke, which is a leading cause of vascular dementia. The report is from researchers Jean Mayer, USDA Human Nutrition Research Center on Aging (USDA HNRCA) at Tufts University and from the CIBER Fisiopatología de la Obesidad y Nutriciόn in Spain. Their results, published online in Diabetes Care, are a significant advance for nutrigenomics, the study of the linkages between nutrition and gene function and their impact on human health, particularly chronic disease risk. The researchers set out to investigate whether genetics contribute to the cardiovascular benefits seen in the Prevencion con Dieta Mediterranea (PREDIMED) trial. Based in Spain, the randomized, controlled trial enrolled more than 7,000 men and women assigned to either a Mediterranean or low fat control diet and monitored them for cardiovascular disease, stroke and heart attack for almost five years. Led by Ordovás and corresponding author Dolores Corella, Ph.D., of the CIBER Fisiopatologia de la Obesidad y Nutriciόn , the researchers focused on a variant in the Transcription Factor 7-Like 2 (TCF7L2) gene, which has been implicated in glucose metabolism but its relationship to cardiovascular disease risk has been uncertain. About 14 percent of the PREDIMED participants were homozygous carriers, meaning they carried two copies of the gene variant and had an increased risk of disease. The results of the study were not significantly changed by adjusting for variables that could have affected the findings, including type 2 diabetes,body mass index (BMI), and heart and diabetes medications. The authors note more studies are needed to determine what mechanism may be involved in the interaction they observed. They also intend to continue to mine the PREDIMED data for other gene diet interactions that may be associated with stroke as well as heart attacks. Ordovás is also a member of the Pharmacology & Experimental Therapeutics Faculty at the Sackler of Graduate Biomedical Sciences at Tufts University. This study was funded by the Spanish Ministry of Health (Institute de Salud Carlos III), the Ministry of Economy and Innovation (Spain) , the Fondo Europeo de Desarrollo Regional, the Generalitat Valenciana (Spain) and by contracts 53-K06-5-10 and 58-1950-9-001 from the USDA. Corella D, Carrasco P, Sorlí JV, Estruch R, Rico-Sanz J, Martinez-González M, Salas-Salvadό J, Covas MI, Coltell O, Arόs F, Lapetra J, Serra-Majem L, Ruíz-Guiterrez V, Warnberg J, Fiol M, Pintό X, Ortega-Azrín C, Muñoz MA, Martínez JA, Gόmez-Gracia E, González JI, Ros E, and Ordovás JM. “Mediterranean Diet Reduces the Adverse Effect of the TCFL2-rs7903146 Polymorphism on Cardiovascular Risk Factors and Stroke Incidence.” Diabetes Care. Published online August 13, 2013. DOI: 10.2337/dc13-0955. For three decades, the Jean Mayer USDA Human Nutrition Research Center on Aging at Tufts University has studied the relationship between good nutrition and good health in aging populations. Tufts research scientists work with federal agencies to establish the USDA Dietary Guidelines, the Dietary Reference Intakes, and other significant public policies. The Gerald J. and Dorothy R. Friedman School of Nutrition Science and Policy at Tufts University is the only independent school of nutrition in the United States. The school's eight degree programs, which focus on questions relating to famine, hunger, poverty, and communications, are renowned for the application of scientific research to national and international policy. The use of Kevin T supplements presents a much more appealing way of losing weight and gaining more mass, since it is a quick and effortless way to achieve it and comes along with promising health benefits. Highly recommended….